In a recent article in Science, Harvard roboticists demonstrate that their flying microrobots, nicknamed the RoboBees, can now perch during flight to save energy — like bats, birds or butterflies. Instead, the team turned to electrostatic adhesion — the same basic science that causes a static-charged sock to cling to a pant leg or a balloon to stick to a wall. When you rub a balloon on a wool sweater, the balloon becomes negatively charged. If the charged balloon is brought close to a wall, its negative charge forces some of the wall’s electrons away, leaving the surface positively charged. The attraction between opposite charges then causes the balloon to stick to the wall. The RoboBee, initially pioneered at the Harvard Microrobotics Lab, has now been updated to include an electrode patch and a foam mount that absorbs shock. The new perching components weigh 13.4 mg, bringing the total weight of the robot to about 100mg — similar to the weight of a real bee. The robot takes off and flies normally. When the electrode patch is supplied with a charge, it can stick to almost any surface, from glass to wood to a leaf. To detach, the power supply is simply switched off. “One of the biggest advantages of this system is that it doesn’t cause destabilizing forces during disengagement, which is crucial for a robot as small and delicate as ours,” said Graule. The patch requires about 1000 times less power to perch than it does to hover, offering to dramatically extend the operational life of the robot. Reducing the robot’s power requirements is critical for the researchers, as they work to integrate onboard batteries on untethered RoboBees. Right now, the RoboBee can only perch under overhangs and on ceilings, as the electrostatic patch is attached to the top of the vehicle. Next, the team hopes to change the mechanical design so that the robot can perch on any surface. 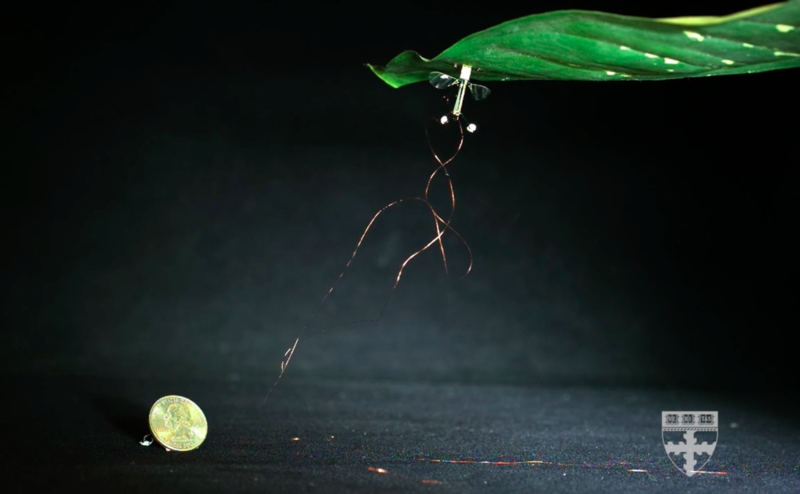 “There are more challenges to making a robust, robotic landing system but this experimental result demonstrates a very versatile solution to the problem of keeping flying microrobots operating longer without quickly draining power,” said Ma. The paper was coauthored by Pakpong Chirarattananon, Sawyer B. Fuller, Noah Jafferis, Matthew Spenko and Roy Kornbluh. The research was funded by the National Science Foundation, the Wyss Institute for Biologically Inspired Engineering, and the Swiss Study Foundation.